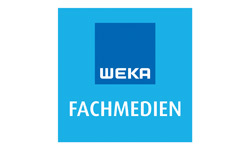 WEKA FACHMEDIEN GmbH is ranging among the leading specialized media publishing houses for the target markets automation, electronics as well as ICT. WEKA FACHMEDIEN sets standards in B-to-B communications. The portfolio contains renowned media brands such as “Markt&Technik“, “Elektronik“, “Elektronik automotive“, “DESIGN&ELEKTRONIK“, “Computer&AUTOMATION“, “ENERGIE&TECHNIK“, “MEDIZIN+elektronik“, “elektrobörse Smarthouse“, “elektrobörse Handel“, “funkschau“ and “funkschau handel“ as well as the successful web services “elektroniknet.de“, “computer-automation.de“, “funkschau.de“, “energie-und-technik.de“, “karriere-ing.de“ and “next-community.de“. The eldest brand of WEKA FACHMEDIEN was launched 84 years ago (!) while the most recent one is just a little older than a year.